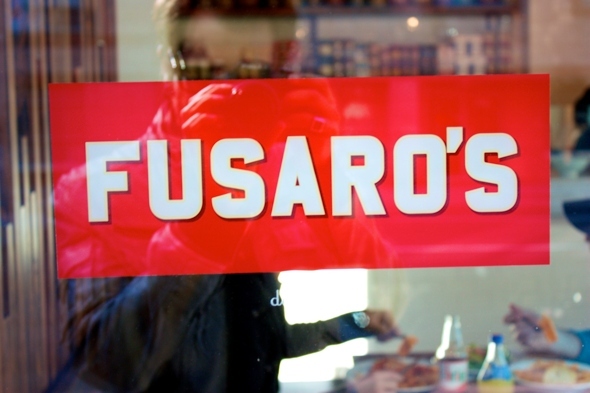 Fusaro's has just opened a second location on Richmond St. East and it's already getting crowded. 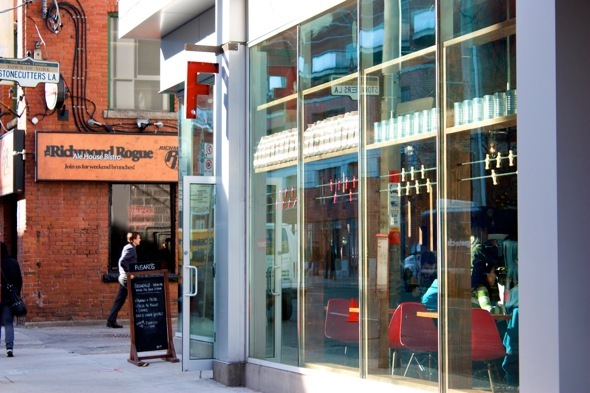 Compared to the original location on Spadina , this new spot is even smaller but the attention to design really pays off. 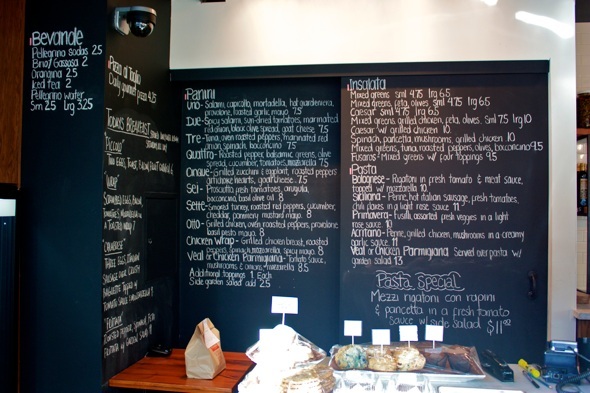 Walking in you see a giant blackboard menu and decor reminiscent of a traditional Italian eatery with white marble covering the side of the kitchen, rustic wooden tables, and red seats in the dining area. Of course, it's not Italian without a large stainless steel espresso machine - and biscotti. Just behind the food bar there's a shelf of bottled hot peppers and extra virgin olive oil. 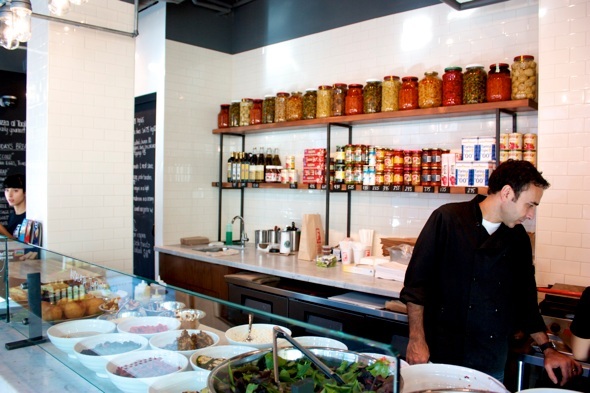 The entire set-up (and bustling atmosphere) reinforces that everything here is authentic and fresh. The Uno panini at $7.50 (top photo) consists of salami, capicollo, mortadella, hot giardiniera (hot mixed pickled vegetables), provolone cheese, and roasted garlic mayo. The bread is grilled perfectly and elicits a satisfying crunch as I take my first bite. The hot giardiniera gives the sandwich a nice kick while the salami's strong flavour is more than enough to solidify its position as the main attraction. I also really dig the melted provolone, just trickling out the side of the panini. My dad is my dining companion on this day and he orders up a small mixed greens salad with feta and olives ($4.75) that comes with possibly the best house dressing in the city - a wine vinaigrette with a great tang. Unlike some salads around the city, this one impresses with its quality ingredients - highlighted by firm tomatoes that are lush red, and juicy. 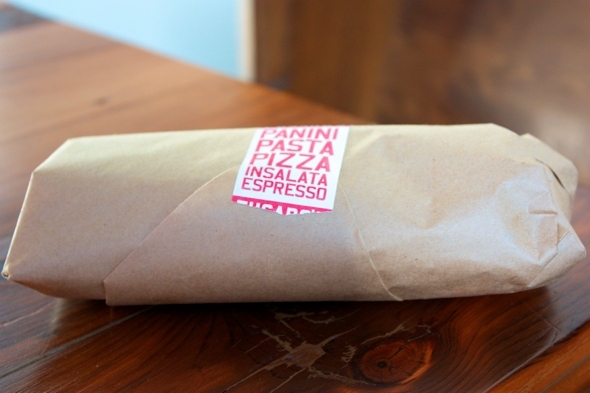 At Fusaro's, they display their daily gourmet pizza (4.25) at the food bar. My dad decided to pair his salad with the Al Taglio . 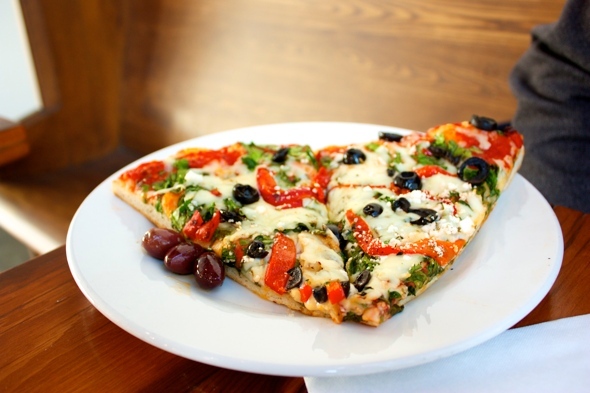 This pizza is topped with roasted red peppers, black olives, feta, arugula, and mozzarella cheese. It's good and hearty with a delicate crisp consistent throughout the entire slice. Tempted to sample more of the offerings here, I get the chicken wrap ($8) to go. 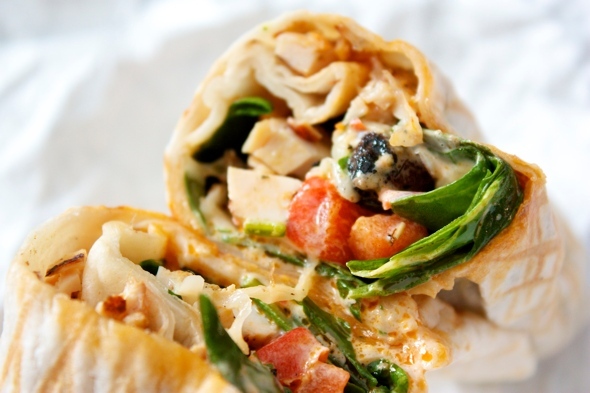 Filled with grilled chicken breast, roasted red peppers, spinach, mozzarella, hot pepper spread, and season mayo, it's accented by cross grill marks that make me covet it even more. The chicken is plentiful (as it should be) and tender and the mayo complements the colourful greens and veggies inside. 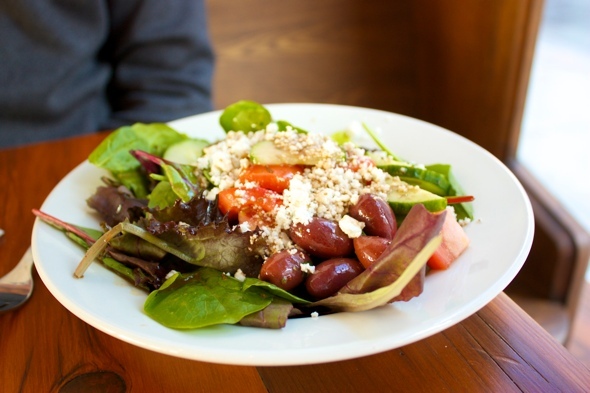 Overall, Fusaro's is a welcome addition to this part of town and represents a dependable lunch and dinner option for those living or working in the area. Service is fast and friendly and despite having just opened it already has a cozy neighbourhood feel.